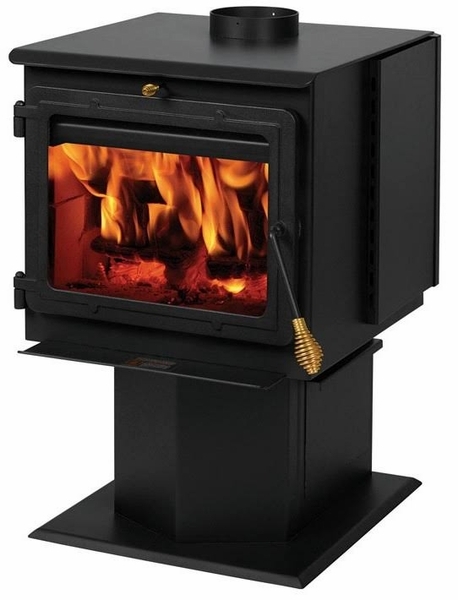 Modern technology has combined with the old world charm of a glowing fire to create the wood burning stove. England Stove Works has created a stove that allows you enjoy time with loved ones, all the while, enjoying the glow and warmth of a roaring fire. This stove features Automatic Air Setback, a special and patent pending feature, that brings the air back into the fire. This allows you to ignite the stove and eliminates the need to constantly add logs, move ash and spend excessive amounts of time nurturing your fire. Feel the glow, not the work, and enjoy this wood burning stove today. What are the dimensions of this stove and the firebox size? Is it UL listed? It is listed to UL 1482 and is an EPA Certified stove. The units dimensions are 23 1/4”W x 36”H x 26 7/8”D. The firebox is 2.45 Cu. Ft and accepts up to 18" logs.